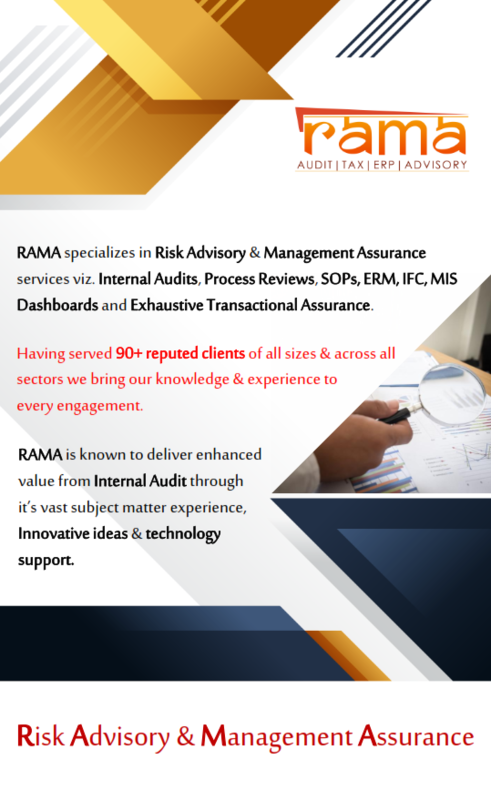 With the vast experience of RAMA’s top management team in Internal Audit, our internal audit methodology is customized to align with the client’s goals and objectives, simultaneously ensuring high quality standards as per globally accepted Internal Audit practices and frameworks. Aimed at specific objectives, as per management’s directions, to analyse performance of various processes, assessment of methods and policies, optimum utilisation of business resources, tactical and strategic planning and employees & organizational improvement. Our management audit services involve review of aspects like organizational objectives, policies, procedures, structure, control and system in order to check the efficiency or performance. RAMA’s in-depth knowledge base of processes, controls and ERP systems equips our team to execute niche consulting assignments on Business Process Re-engineering (BPR). Our BPR projects are structured to optimize end-to-end business processes thorough in-depth study / understanding of existing processes, walk-through of live transactions and activities in ERP systems as well as on the floors and data analytics. → RAMA’s team for executing BPR assignments is a best combination of process champions having in-depth process, industry knowledge, data analysts being experts in manoeuvring huge data and IT professionals – proficient in ERP systems. → Benchmarking of business processes with it’s vast database of best practices in each process, created over the years and being constantly updated. Standard Operating Procedures (SOPs) are the backbone of the business processes, so is the critical component of organization’s overall Goverance, Risk and Control framework. RAMA’s team is having a wide exposure in designing and documenting SOP for various large and mid-size corporates across industries. Although, our SOP documents are customized depending upon the needs of the organizations, however, RAMA ensures designing interactive, crisp and task-oriented documents to help the users to perform their tasks and duties efficiently & effectively. Our process of designing SOPs ensures constructive involvement of Process Owners and their team, this approach helps in getiing quick buy-in from the execution team and swift implementation of laid down procedures. RAMA’s role as an Internal Auditors of large and mid-size corporates rightly places us in assisting orgaizations in effectively compliying to the enhanced requirements of Internal Financial Controls (IFC) / Internal Control Over Financial Reporting (ICFR). We assist the Management in ensuring that Internal Controls over Financial Reporting are adequate and operting effectively, also report to Audit Committees, Independent Directors and provide required inputs to Statuory Auditors for the purpose of reporting in Auditor’s Report. RAMA has developed a specialsed service product for assisting organizations in monitoring and safeguarding of its fixed assets including review of FAR (Fixed Assets Register), Codification of Assets, developing new technology based Asset Identification Tags, three way linking i.e. Finanical Records – FAR – Physical Asset Records and physical verification of assets. RAMA has the knowledge base for Developing and Instituting a comprehensive Legal and Compliance Framework (LCFM) which clearly defines the statutory requirements of various applicable laws (Financial, Factory Related, Labour Laws, Environment & Pollution and Shop & Establishment etc. ), periodicity, compliance status and responsibility etc. Such compliance tracker can be prepared manually in Excel or in ERP system also. By implementing such LCFM, regular updation, tracking and monitoring of compliances and / or non compliances becomes Easy to Manage Task and provides greater assurance to CFOs, Audit Committees, Independent Directors and the Board of Directors.